Citation: White LD, White LK, Baxter DF, et al. Adult Onset Acute Disseminated Encephalomyelitis Following Appendicitis: A Case Report. J Neurol Neurosci. 2016, 7:S3. Acute disseminated encephalomyelitis (ADEM) is a postinfectious autoimmune demyelinating disease of the central nervous system. ADEM typically presents with non-specific symptoms including nausea, vomiting, fever and headache. This then progresses to neurological deficits such as motor weakness, altered sensorium and often significant morbidity or mortality. Typically the infectious insult is thought to be a transient viral infection or vaccination. We describe a case of ADEM in a 50 yearold woman who presented to a rural emergency department fifteen days after surgery to remove a gangrenous appendix. She presented febrile and with signs of encephalopathy. Initial computed tomography (CT) findings showed a left parietal lesion with mass effect, and there was a moderate neutrophilia and lymphocytosis. Empirical therapy for a viral or bacterial cerebral infection was commenced including dexamethasone. After transfer to a tertiary referral center, and after five days of investigation and treatment and LP was performed and the diagnosis of ADEM was reached. Given the lack of response to steroids a course of intravenous immunoglobulin (IVIG) was commenced. Our patient responded extremely well on IVIG, showing substantial recovery within 24 hours. ADEM is a rare condition but is poorly understood in comparison to other diseases of similar incidence. Currently there is insufficient pathophysiological understanding and primary evidence to guide the use of treatment options even when the diagnosis is reached in a timely manner. Further case series or small trials are eagerly awaited. They may allow us to better formulate a treatment approach that can reduce the morbidity associated with even the best outcomes of our current therapies. Acute disseminated encephalomyelitis (ADEM) is a postinfectious autoimmune encephalomyelitis [1,2]. This autoimmune phenomenon occurs in genetically susceptible individuals, resulting in a rapid inflammatory demyelination of the brain and spinal cord [1,2]. ADEM is typically a monophasic illness, preceded by a viral illness of vaccination days to weeks prior to presentation . Whilst the peak incidence of ADEM is in childhood, there are an increasing number of cases reported in adults and the elderly . ADEM is a poorly understood neurological illness, commonly mistaken for multiple sclerosis and primary neurological infections . In this article we present a case of a 50-year-old who presented with acute neurological symptoms and describe how ADEM was diagnosed and treated. A 50 year old woman presented to a rural emergency department with a 24 hour history of fever, nausea, headache, rigors and encephalopathy. This presentation was on the background of an appendectomy for a perforated, gangrenous, suppurative appendicitis fifteen days prior to presentation. She had no past history of unexplained neurological symptoms. Upon presentation she became drowsy (GCS 14) and developed right sided facial, arm and leg weakness as well as reduced reflexes and ataxia on the right side. The initial CT brain was performed within thirty minutes of arrival showing a diffuse lesion of the left parietal lobe with a mildly compressed left ventricle left and slight midline shift (Figure 1). Due to raised intra-cranial pressure lumbar puncture was delayed. She had a persistent fever of 39°C and leucocytosis of 14.7 x 10^9/L (neutrophilia 11.3; Table 1), thus intravenous (IV) acyclovir, ceftriaxone, metronidazole and dexamethasone were initiated. 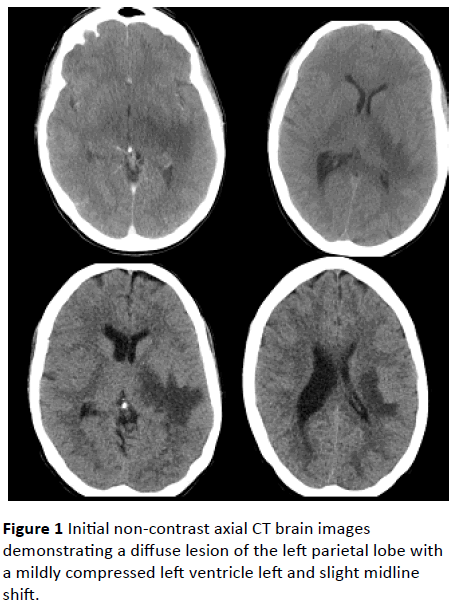 Figure 1: Initial non-contrast axial CT brain images demonstrating a diffuse lesion of the left parietal lobe with a mildly compressed left ventricle left and slight midline shift. Due to the mass effect and paucity of specialist services she was transferred on the day of presentation to a tertiary neurology/neurosurgery unit. Examination findings following transfer included a right-sided homonymous hemianopia, ataxic gait, right upper motor neuron facial weakness, rightsided limb weakness most pronounced in the upper lime and a positive Babinski sign on the right side. Further investigations included an MRI brain (Figure 2) and lumbar puncture (LP). The MRI showed lesions affecting the white matter of the left pons, left midbrain, and left mesial/parietal regions. No old or chronic changes were detected on MRI. At that time it was again decided that the mass effect precluded performing a lumbar puncture and she was continued on IV acyclovir, ceftriaxone, metronidazole and dexamethasone. Figure 2: Coronal MRI (T2 top row and FLAIR bottom row) images demonstrating lesions affecting mostly the white matter of the left pons, left midbrain, and left mesial/parietal regions. On day five of admission all components of the vasculitis screen returned negative and the LP was performed which showed a reactive lymphocytosis (Table 2). She was subsequently diagnosed with ADEM with poor response to intravenous steroids (Table 3). A five day course of intravenous immunoglobin (IVIG) was then initiated. Within a day of starting IVIG the patient showed a marked improvement in cognition and a reduced severity of hemiplegia. Microscopy showed increased numbers of small and medium sized lymphocytes with some histiocytes present.No malignant cells present.Morphology favours that of a reactive lymphocytosis. Table 2: Cerebrospinal fluid results. Table 3: Diagnostic criteria suggestive of ADEM . On day twelve the patient was transferred to rehabilitation with a right-sided homonymous hemianopia, reduced sensation on the right side of her face; lower right facial weakness with dysarthria, right arm and leg weakness and ataxia (most pronounced distal arm and leg) with reduced tone. The patients EEG showed no evidence of epileptiform or seizure activity. Residual MRI changes four months later showed an area of chronic parenchymal loss/neuronal degeneration extending from the left parietal lobe, lateral to the left thalamus and down through the medial temporal lobe and cerebral peduncle to the pons. Acute disseminated encephalomyelitis (ADEM) is most commonly thought to be a post-viral, post-vaccination autoimmune phenomenon [1-3]. We present a unique case of ADEM following acute appendicitis which was potentially secondary to a bacterial infection. There are a number of pathogens which have been linked to the development of ADEM. The most commonly cited viral causes include coxsackie, cytomegalovirus, esptein-barr, herpes simplex, hepatitis A, measles, coronavirus, rubella and varicella zoster. In recent literature numerous non-viral organisms have been linked to ADEM including Leptospira, Mycoplasma pneumoniae, beta haemolytic streptococcus, rickettsia and Borrelia burgdorferi . Given the link to antecedent infections, the most widely accepted hypothesis for the pathogenesis of ADEM is the ‘molecular mimicry’ hypothesis . This describes an acquired autoimmune phenomenon in genetically susceptible populations which form post-infectious autoantibodies to myelin proteins (e.g. proteolipid protein, myelin basic protein and myelin oligodendrocyte protein) [5-7]. An alternate theory is that ADEM occurs secondary to an inflammatory response causing vascular congestion and increased permeability of central nervous system vasculature following e exposure to a foreign antigen [8,9]. This is then thought to cause an inflammatory cascade involving perivenous haemorrhage, oedema and infiltration of inflammatory cells resulting in demyelination, gliosis and necrosis [8,9]. Based on these theorized mechanisms, numerous case reports and a number of uncontrolled studies have determined that immunosuppression is the mainstay of ADEM treatment . Several studies have demonstrated benefit with high dose IV methylprednisolone treatment for three to five days, followed by an oral taper over six weeks . Along with the initial steroid treatment, empiric antimicrobial cover is recommended until infectious causes have been ruled out [1,3]. In patients showing a poor response or failure of high dose glucocorticoids, IVIG therapy for five to seven days has been recommended . Current estimates show that approximately half of patients with ADEM that fail a trail of high dose glucocorticoids will respond to IVIG [1,3]. The final line in management of ADEM is plasma exchange; however the optimum regiment and benefit are still poorly defined in the literature. Even in the context of a positive response to treatment it is estimated that up to one third of patients will be left with a significant permanent disability . Furthermore of the survivors of the acute ADEM insult up to one third will convert to multiple sclerosis within a year . ADEM is a poorly understood neurological illness with significant long term consequences. This case demonstrates the presentation of ADEM post-appendicitis in a middle-aged woman, with a positive response to IVIG therapy. Given that significant cognitive and physical impairment is common sequelae of ADEM, it would be beneficial to see further research into the pathological mechanism and how management of this disease can be optimized to improve short and longer term patient outcomes. The patient gave consent for the publication of this manuscript and the associated images. The authors of this publication have no conflicts of interest to declare. Tenembaum S, Chitnis T, Ness J, Hahn J (2007) Acute disseminated encephalomyelitis. Neurology 68: S23-S36. Wender M (2011) Acute disseminated encephalomyelitis (ADEM). J Neuroimmunol 231: 92-99. Steiner I, Kennedy P (2015) Acute disseminated encephalomyelitis: current knowledge and open questions. J Neurovirol 21: 473-479. Wucherpfennig K, Strominger J (1995) Molecular mimicry in T cellmediated autoimmunity: viral peptides activate human T cell clones specific for myelin basic protein. Cell 80: 695-705. Clatch R, Lipton HL, Miller SD (1986) Characterization of Theiler’s murine encephalomyelitis virus (TMEV)-specific delayed-type hypersensitivity responses in TMEV-induced demyelinating disease: correlation with clinical signs. J Immunol 136: 920-927. Rodriguez M, Pavelko K, Njenga M, Logan W, Wettstein P (1996) The balance between persistent virus infection and immune cells determines demyelination. J Immunol 157: 5699-5709. Katz LY, Neville K, Girvin A, Vanderlugt C, Pope J, et al. (1999) Endogenous presentation of self-myelin epitopes by CNS-resident APCs in Theiler’s virusinfected mice. J Clin Invest 104: 599-610. McMahon E, Bailey S, Castenada C, Waldner H, Miller S (2005) Epitope spreading initiates in the CNS in two mouse models of multiple sclerosis. Nat Med 11: 335-339.